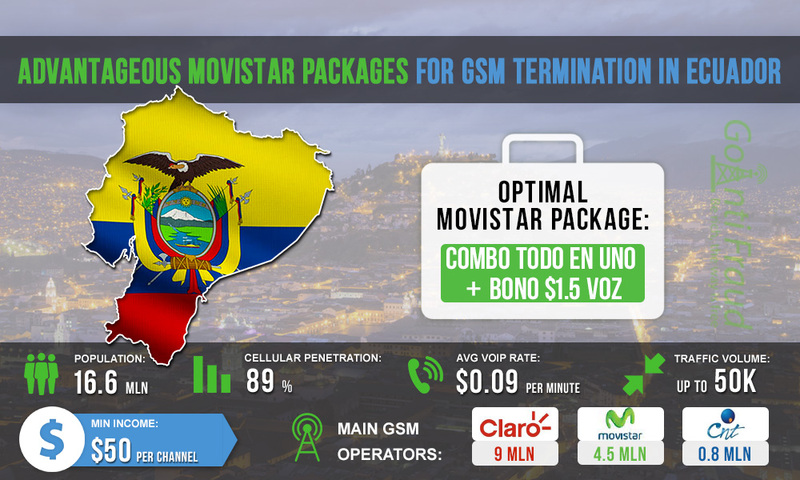 With an average rate of 9 cents, Ecuador is an attractive destination for VoIP call termination. There is a well-developed mobile communications market, and local GSM operators offer prepaid packages for subscribers. Movistar is one of the two largest operators in Ecuador. In order to do the profitable termination of voice traffic, you need to choose the optimal tariff plan. The number of connections to Movistar accounts more than 4.5 million. SIM-cards offered by the operator to prepaid subscribers are called SuperChip Prepago and cost $5. By the way, prices for cellular services in Ecuador are set in USD. The standard rate for on-net calls is $0.1 per minute. By default, the starter package includes the Combo Todo En Uno weekly plan for $3. Combo Todo En Uno $15. It includes 150 bonus minutes for calls to all operators' numbers. Combo Todo En Uno $6. It includes 60 bonus minutes for calls to all operators' numbers. Combo Todo En Uno $3. It includes 20 bonus minutes for calls to all operators' numbers. There are also bonus offers that are valid for up to 5 days. Bono $2 and Bono $1 are designed for package data to use the mobile Internet. Bono $1.5 voz is a one-day package that provides unlimited calls to all operators’ numbers by 11.59 p.m. The best option is to terminate calls via the SuperChip Prepago SIM-card for $5, with Combo Todo En Uno $3 included. And after you have spent free 20 minutes, you should connect Bono $ 1.5 voz. Terminating 5 hours per day, one minute of the call via this package will cost $0.005, as well as the daily cost of new SIM cards. Accordingly, you will be able to make about $400 from each channel of the GoIP GSM gateway.